"Pediatric pulmonology" redirects here. For the journal, see Pediatric Pulmonology. "Pulmonary Medicine" redirects here. For the journal, see Pulmonary Medicine (journal). Schematic view of the human respiratory system with their parts and functions. Pulmonology is a medical speciality that deals with diseases involving the respiratory tract. 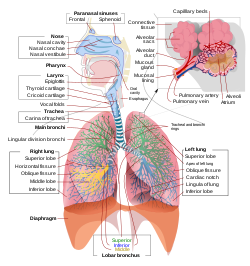 The term is derived from the Latin word pulmō, pulmōnis ("lung") and the Greek suffix -λογία, -logia ("study of"). Pulmonology is synonymous with pneumology (from Greek πνεύμων ("lung") and -λογία), respirology and respiratory medicine. One of the first major discoveries relevant to the field of pulmonology was the discovery of pulmonary circulation. Originally, it was thought that blood reaching the right side of the heart passed through small 'pores' in the septum into the left side to be oxygenated, as theorized by Galen; however, the discovery of pulmonary circulation disproves this theory, which had previously been accepted since the 2nd century. Thirteenth century anatomist and physiologist Ibn Al-Nafis accurately theorized that there was no 'direct' passage between the two sides (ventricles) of the heart. He believed that the blood must have passed through the pulmonary artery, through the lungs, and back into the heart to be pumped around the body. This is believed by many to be the first scientific description of pulmonary circulation. Although pulmonary medicine only began to evolve as a medical specialty in the 1950s, William Welch and William Osler founded the 'parent' organization of the American Thoracic Society, the National Association for the Study and Prevention of Tuberculosis. The care, treatment, and study of tuberculosis of the lung is recognised as a discipline in its own right, phthisiology. When the specialty did begin to evolve, several discoveries were being made linking the respiratory system and the measurement of arterial blood gases, attracting more and more physicians and researchers to the developing field. Surgery of the respiratory tract is generally performed by specialists in cardiothoracic surgery (or thoracic surgery), though minor procedures may be performed by pulmonologists. Pulmonology is closely related to critical care medicine when dealing with patients who require mechanical ventilation. As a result, many pulmonologists are certified to practice critical care medicine in addition to pulmonary medicine. There are fellowship programs that allow physicians to become board certified in pulmonary and critical care medicine simultaneously. Interventional pulmonology is a relatively new field within pulmonary medicine that deals with the use of procedures such as bronchoscopy and pleuroscopy to treat several pulmonary diseases. Interventional pulmonology is increasingly recognized as a specific medical specialty. Physical diagnostics are as important as in other fields of medicine. Percussion of the lung fields for dullness or hyper-resonance. Rales or rhonchi heard over lung fields with a stethoscope. Medication is the most important treatment of most diseases of pulmonology, either by inhalation (bronchodilators and steroids) or in oral form (antibiotics, leukotriene antagonists). A common example being the usage of inhalers in the treatment of inflammatory lung conditions such as asthma or chronic obstructive pulmonary disease. Oxygen therapy is often necessary in severe respiratory disease (emphysema and pulmonary fibrosis). When this is insufficient, the patient might require mechanical ventilation. Pulmonary rehabilitation has been defined as a multidimensional continuum of services directed to persons with pulmonary disease and their families, usually by an interdisciplinary team of specialists, with the goal of achieving and maintaining the individual's maximum level of independence and functioning in the community. Pulmonary rehabilitation is intended to educate the patient, the family, and improve the overall quality of life and prognosis for the patient. Interventions can include exercise, education, emotional support, oxygen, noninvasive mechanical ventilation, optimization of airway secretion clearance, promoting compliance with medical care to reduce numbers of exacerbations and hospitalizations, and returning to work and/or a more active and emotionally satisfying life. These goals are appropriate for any patients with diminished respiratory reserve whether due to obstructive or intrinsic pulmonary diseases (oxygenation impairment) or neuromuscular weakness (ventilatory impairment). A pulmonary rehabilitation team may include a rehabilitation physician, a pulmonary medicine specialist, and allied health professionals including a rehabilitation nurse, a respiratory therapist, a physical therapist, an occupational therapist, a psychologist, and a social worker among others. Additionally breathing games are used to motivate children to perform pulmonary rehabilitation. In the United States, pulmonologists are physicians who, after receiving a medical degree (MD or DO), complete residency training in internal medicine, followed by at least two additional years of subspeciality fellowship training in pulmonology. After satisfactorily completing a fellowship in pulmonary medicine, the physician is permitted to take the board certification examination in pulmonary medicine. After passing this exam, the physician is then board certified as a pulmonologist. Most pulmonologists complete three years of combined subspecialty fellowship training in pulmonary medicine and critical care medicine. In the United States, pediatric pulmonologists are physicians who, after receiving a medical degree (MD or DO), complete residency training in pediatrics, followed by at least three additional years of subspeciality fellowship training in pulmonology. Pulmonologists are involved in both clinical and basic research of the respiratory system, ranging from the anatomy of the respiratory epithelium to the most effective treatment of pulmonary hypertension. Scientific research also takes place to look for causes and possible treatment in diseases such as pulmonary tuberculosis and lung cancer. ^ ACP: Pulmonology: Internal Medicine Subspecialty. Acponline.org. Retrieved on 2011-09-30. ^ Sengupta, Nandini; Sahidullah, Md; Saha, Goutam (August 2016). "Lung sound classification using cepstral-based statistical features". Computers in Biology and Medicine. 75 (1): 118–129. doi:10.1016/j.compbiomed.2016.05.013. PMID 27286184. ^ Sharif Kaf A-Ghazal (2002). "The discovery of the pulmonary circulation – who should get the credit: ibn Al-Nafis or William Harvey" (PDF). JISHIM. 2: 46. ^ "American Thoracic Society - Overview". www.thoracic.org. Retrieved 2019-01-25. ^ Jacobs, Henry Barton (1904-12-03). "National Association for the Study and Prevention of Tuberculosis". Journal of the American Medical Association. XLIII (23): 1712. doi:10.1001/jama.1904.02500230042014. ISSN 0002-9955. ^ Lauzardo, Michael; Ashkin, David (2000-05-01). "Phthisiology at the Dawn of the New Century". Chest. 117 (5): 1455–1473. doi:10.1378/chest.117.5.1455. ISSN 0012-3692. ^ History of the Division. Hopkinsmedicine.org. Retrieved on 2011-09-30. ^ "Cardiothoracic Surgery | Essentia Health | MN, WI, ND". www.essentiahealth.org. Retrieved 2019-01-25. ^ "Cardiothoracic surgery". Health Careers. 2015-04-07. Retrieved 2019-01-25. ^ "Pulmonary Disease | Internal Medicine Subspecialties | ACP". www.acponline.org. Retrieved 2019-01-25. ^ "Interventional Pulmonology: Procedures, Uses, and Effects". WebMD. Retrieved 2019-01-25. ^ Seijo, Luis M.; Sterman, Daniel H. (2001-03-08). "Interventional Pulmonology". New England Journal of Medicine. 344 (10): 740–749. doi:10.1056/NEJM200103083441007. ISSN 0028-4793. PMID 11236779. ^ "Interventional Pulmonology Diagnostic and Therapeutic Procedures". www.pamf.org. Retrieved 2019-01-25. ^ Luis M. Seijo & Daniel H. Sterman (2001). "Interventional Pulmonology". N. Engl. J. Med. 344 (10): 740–49. doi:10.1056/NEJM200103083441007. PMID 11236779. ^ "Cystic Fibrosis - Pediatrics". MSD Manual Professional Edition. Retrieved 2019-01-25. ^ "Evaluation of the Pulmonary Patient - Pulmonary Disorders". MSD Manual Professional Edition. Retrieved 2019-01-25. ^ "Pulmonary Tests and Procedures | Johns Hopkins Medicine Health Library". www.hopkinsmedicine.org. Retrieved 2019-01-25. ^ "Pulmonary Diagnostic Tests & Procedures | Essentia Health". www.essentiahealth.org. Retrieved 2019-01-25. ^ "Bronchoscopy | Johns Hopkins Medicine Health Library". www.hopkinsmedicine.org. Retrieved 2019-01-25. ^ "How Do Chest X-Rays Work?". www.hopkinsmedicine.org. Retrieved 2019-01-25. ^ "Computed Tomography (CT or CAT) Scan of the Chest | Johns Hopkins Medicine Health Library". www.hopkinsmedicine.org. Retrieved 2019-01-25. ^ "How Does a PET Scan Work?". www.hopkinsmedicine.org. Retrieved 2019-01-25. ^ "How to Prepare for a Sleep Study". www.hopkinsmedicine.org. Retrieved 2019-01-25. ^ "Oxygen Therapy - Lung and Airway Disorders". MSD Manual Consumer Version. Retrieved 2019-01-25. ^ "Pulmonary Rehabilitation | Essentia Health | MN, ND, WI". www.essentiahealth.org. Retrieved 2019-01-25. ^ "Overview of Pulmonary Rehabilitation - Lung and Airway Disorders". MSD Manual Consumer Version. Retrieved 2019-01-25. ^ "What is a Pediatric Pulmonologist?". HealthyChildren.org. Retrieved 2019-01-25.